Did a Karaite Invent the Concept of Principles of Faith? 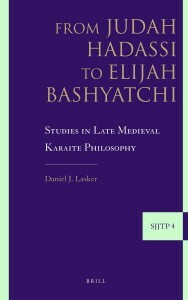 Professor Lasker provides direct translations of many classical Karaite works. Most religious Jews are aware of Maimonides’ 13 principles of faith. But Maimonides himself was not even the first person of his era to compose principles of faith. It turns out that Maimonides was beat to the punch by the 12th Century Karaite Sage Judah Hadassi. Today, we’ll examine whether Hadassi was the first to create such a list and we provide a video by Eli Shmuel discussing Haddassi’s principles of faith. “And we have heard from our teachers that the heretic Anan and his friends used to write down heresies and lies and hide them in the ground.